Genetic testing is important for any breed, for the dog’s individual health and wellbeing as well as for any breeding dogs to ensure healthy puppies in future generations. Paw Print Genetics offers genetic testing for three diseases known to occur in the Alaskan Malamute. Testing for these diseases provides you the information that you need to keep your dog healthy and to select appropriate breeding pairs to avoid producing affected puppies. The first disease is the Alaskan Malamute Polyneuropathy. This disease is an inherited neuromuscular condition that affects dogs between the ages of 3 and 19 months of age. The first signs of this disease may be a change in their bark, noisy breathing, exercise intolerance and loss of hindlimb coordination. The disease is progressive resulting in muscle wasting, abnormal gait or inability to walk. Testing of this disease is required for CHIC and using results in your breeding program can eliminate producing affected pups. This disease is inherited in a recessive manner meaning that two copies of the mutation are required to produce the symptoms of polyneuropathy. Dogs that have one copy of the mutation are carriers and are not affected. Breeding carriers to clear (normal) dogs will result in about 50% of pups being carriers and about 50% being clear. Pups from a carrier x clear breeding should be tested to determine which pups are carriers if those dogs will become breeding dogs. 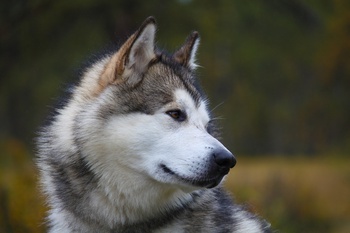 Alaskan Malamutes are also susceptible to an inherited eye condition called Cone Degeneration. With this condition, dogs that have two copies of the mutation will develop day blindness and photophobia (light sensitivity) between the ages of 8-12 weeks. This degeneration of the cells in the retina, called the cone photoreceptors, will progress over the life of the dog, with adult dogs having complete loss of the cone cells. Although affected dogs will have difficulty seeing during the day, the night vision is not affected, and affected dogs can still see in low light. Testing for Cone Degeneration will provide breeders information about which dogs are carriers and support breeding carriers only to clear dogs. Like with Polyneuropathy, carrier x clear breedings will produce about 50% carrier pups and about 50% clear pups and genetic testing will be needed on the pups to identify the carriers. The last disease known to Alaskan Malamutes that can be tested with genetics is Degenerative Myelopathy. Degenerative Myelopathy, or DM, is a progressive neuromuscular disease that affects dogs later in life. Known as Lou Gehrig’s disease or amyotrophic lateral sclerosis in humans, in dogs DM is inherited as a recessive condition. Dogs with one copy of the mutation in SOD1 are carriers and dogs with two copies of the mutation in SOD1 are at-risk for developing the disease. This genetic condition is known to have incomplete penetrance, meaning that not all at-risk dogs will develop the condition. There are likely genetic modifiers in the genome that may influence the occurrence of this condition in at-risk dogs. Although the chance of getting the condition in at-risk dogs can be variable, because DM can be tested for in dogs, it is prudent to test for this condition and use the genetic information to avoid producing at-risk pups. Testing your dogs for these genetic conditions will allow you to avoid producing pups with these diseases and help improve the overall health of your breed. If you have any questions about these tests or about genetics in general, Paw Print Genetics has both PhD Geneticists and licensed Veterinarians on staff who can answer your questions. They can be reached at 855-202-4889 (toll free, US & Canada), 509-483-5950 (direct) or through email at AskUs@pawprintgenetics.com.